No bake, minimal effort yet full of flavour and nutrition! 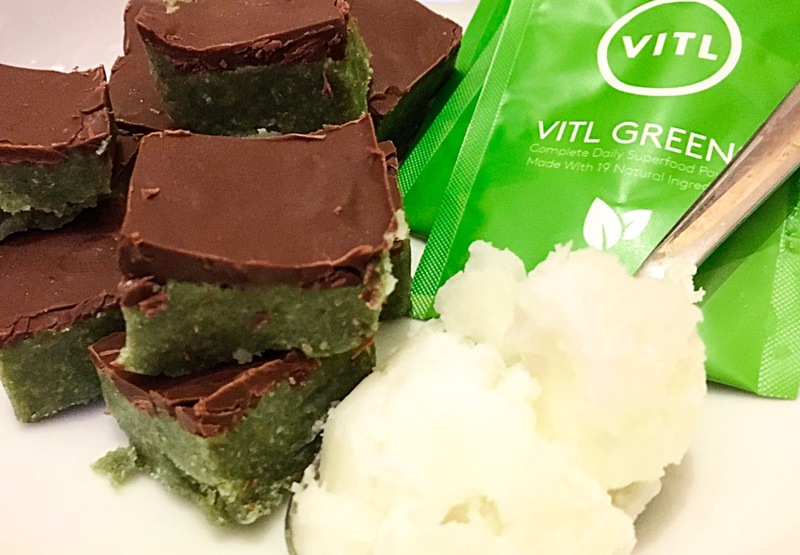 – In your Nutri-bullet place the cashew butter, coconut nectar, Vitl Greens and 2 tablespoons of coconut oil. Blend until completely smooth. -Pour into a lightly greased square or rectangular medium Tupperware and smooth to equal thickness. Place in the fridge for 1 hour to set. – After allowing the cashew mix to set, in a pan on a very low heat, melt the remaining tablespoon of coconut oil and dark chocolate. -Allow to cool off slightly before pouring over the cashew mix ensuring to coat evenly. Put back in the fridge for another hour to set. -Remove from the fridge and slice into 12 squares before devouring. Store in a air tight container and keep in the fridge.